For potato chips you need white chips variety that has thin skin, round or oval, very smooth without any lump and is a bit sweeter. It should be thick and have less starch. There should be no cuts, blemishes etc on the surface. They should be more or less of the same size. 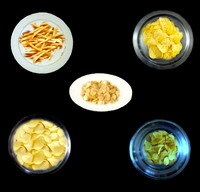 Potato chips can be prepared for instant use or for long time use. Similarly they can be circular or finger chips type as desired. You can have designed ones too depending upon the slicer which produces chips with ridges and other special designs. For this, wash the potato well and wipe. Using the slicer, food processor or knife either you can peel the skin or directly cut into discs of uniform size and medium thickness (Maximum 3 mm) since discs if too thin would char or become reddish brown and if too thick will not be crisp. Take sufficient water to soak the chips and mix the alum in it to dissolve. If you do not get alum, then you can use white vinegar in its place. Let the cut chips remain soaked in this water for 30 minutes. Remove thereafter and was under tap water at least two times to remove any starch sticking to it by moving your palms between them faster since the starch turns the chips brown. Drain the water completely and cool dry the discs over a tissue paper or clean cloth under a ceiling fan. Heat oil in a kaDAi (wok) till frying point and then simmer the flame to medium level after testing the frying point by dropping a piece of potato which should rise up immediately. Fry lot by lot turning from time to time to ensure proper frying till it is slightly of golden yellow colour for about 2 minutes. Remove from oil and place over as strainer or tissue paper to strain excess oil. Allow to cool as otherwise they will not be crispy. Check before adding table salt or rock salt, pepper or chilli powder and storing thereafter in an airtight container. To ensure uniformity in mixing, first keep all the fried chips in a vessel and then add the required quantity of salt and chilli powder. Close the lid and then toss uniformly. Here the ingredients are same as above. Follow the procedure of cutting the discs, soaking in alum or vinegar dissolved water for 30 minutes and then washing twice at least to remove the starch as detailed above. Drain the water and place the discs over a tissue paper for 10 minutes. Meanwhile boil water after adding 2 tsp table salt and remove when it is piping hot. Put off the flame and transfer all the chips from the tissue paper to this hot water and blanch for 5 minutes closing the lid. Drain the water through a strainer and dry in the hot sun. Dry for a day or two till they become bone dry and brittle. If one side is dry turn the other side to the sun to dry. Take out and bring them under room temperature before storing in an air tight container. Once in a while open and test if they remain dry. If not, dry in the sun again for some time. Fry some of these and sprinkle chilli powder or pepper powder. If you need salt you and add that also. Toss well before serving. This entry was posted on March 15, 2013 at 7:52 pm and is filed under Kadamba Recipes with tags Alum granules, black pepper powder, chilli powder, potato, Potato chips, rock salt, table salt, white vinegar. You can follow any responses to this entry through the RSS 2.0 feed. Both comments and pings are currently closed.